After a bit of a rough time in the first two rounds I was out to show to myself that I do have what it takes. I felt that this round was going to be more my kind of terrain and I was going to go all out on the day. Unfortunately I didn’t start off with much luck and I drew the first start… I was after the middle block at least so if there was going to be any tracking or visibility of other runners I would wouldn’t be too disadvantaged. Anyway that was the card I was dealt and there was nothing I could do about that. I had to make it work for me. Straight out of the start of the prologue I felt heavy and tired, I guess it was my body anticipating the suffering it was about to receive. I had a little wobble on the second control then arrived at the pivot just over 6 mins as the two next two runners had just started. I was lucky and had Bryn to show me around the second loop although he was a little bit too fast, as I struggled to keep up. Out of the pivot I took a poor route and lost about a minute, however I was strong to the finish and ended up finishing first. Happy with my run I watched my position slip down the ladder and I ended up in 41 place and around about 5mins behind the leaders. After hanging out and relaxing down by the river it was time to head back to the chasing start in the intense heat. It was super hot, around about 35 deg C, however we did have some luck as the cloud came over and covered the sun for a bit. My legs were pretty tight and not really fresh enough to run on again, so I had to hope that when race time came around they would be ready. Lining up in the start order could almost have been a little intimidating however I felt surprisingly relaxed. Straight out of the gate the hunt was on. I had 7 seconds to catch Matt Ogden, and a few others between 40 and 30 seconds ahead that I could see. I quickly was on the back of Matt as we navigated through the first few. I at one point took a slightly different route but we were pretty much back together again at the control. There was a few hesitations here and there but Matt and I stayed together until the course started to go back up hill. I was suffering to keep up until this point but suddenly Matt fell off the back of me and into the next control I caught another place. On the back of this guy I ran hard and eventually when we came to the next hill I had him. Once I had the Swiss guy I could see another pack of 5 just in front of that. I continued to push and eventually I was beginning to gain on them. A short time later I had the Belgian, then up the hill I must have gained some distance as through the map change I was almost up with Ross and his pack. We then caught a floundering Swede, before all making a bit of a mistake. There was just one hill left to the finish and Ross cut too low, I kept my height and essentially and accidentally cut the corner straight into the control. I had my break, passing 4 in one go. Taking this opportunity, I ran hard, navigated even harder as I was into a good zone. Pain was there but the brain was telling the body it wasn’t much longer. Then into the second last control I caught a glimpse of a NZ top and the hunt was on again. Right to the finish I pushed harder and harder, but not quite hard enough to catch a fading Tim who was 5seconds in front of me! 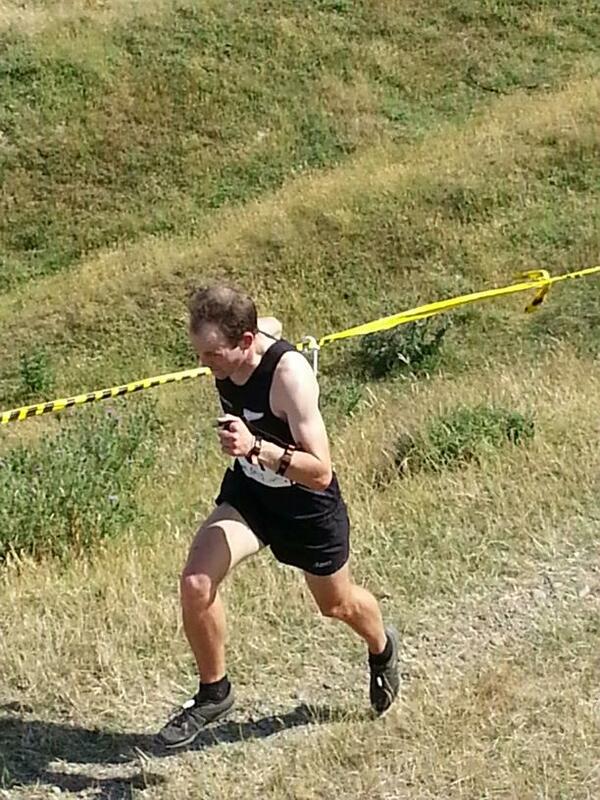 Slogging it into the brutal finish! Once over the finish line it was straight to the ground and promptly water was dumped over my head over and over again. I was thirsty but so tired I couldn’t drink and eventually so much water was poured over my head I almost began to drown as the water sat in the dry grass. I sucked a bit up, and coughed all over the place and eventually moved into the shade to calm down a bit. I was happy with that, I made up 9 places and slipped into 32nd place. I got my first World Cup points, and achieved my goal of top 40 while I was at it too 🙂 However the most satisfying part was hearing from all the NZ supporters out there. I am glad I could live up to the expectations and inspire one or two of them along the way. So Thank you to all those people who were out there cheering me on! It was really cool to represent my country in my country and hopefully I did everyone proud, even though it was only 32nd place!